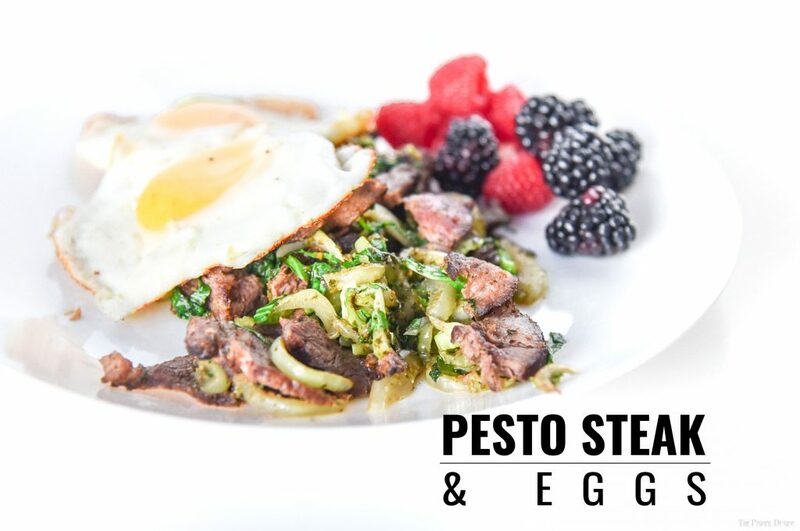 Start your day off strong with a wakeup call for your taste buds from Pesto Steak and Eggs. Keto breakfast in under 7 minutes! “One more sleep 'til breakfast!” One of my all-time favorite quotes. I love breakfast. Not the bready, cereal versions that so many people do every day. No way. I'm talking omelettes, bacon, eggs benedict, breakfast salads, hash browns, breakfast sausage, fruit salads, and pesto steak and eggs. What's not to like? I love “breakfast foods” any time of day. Yet, when I'm traveling I'll eat anything for breakfast. Sometimes just local fruit. In Thailand I started the day off with street-meat and a smoothie. Here, in Bali, it depends on the day. But I am looking forward making a cheesy omelette when I get home. Have you been to Bali? I'm loving it. 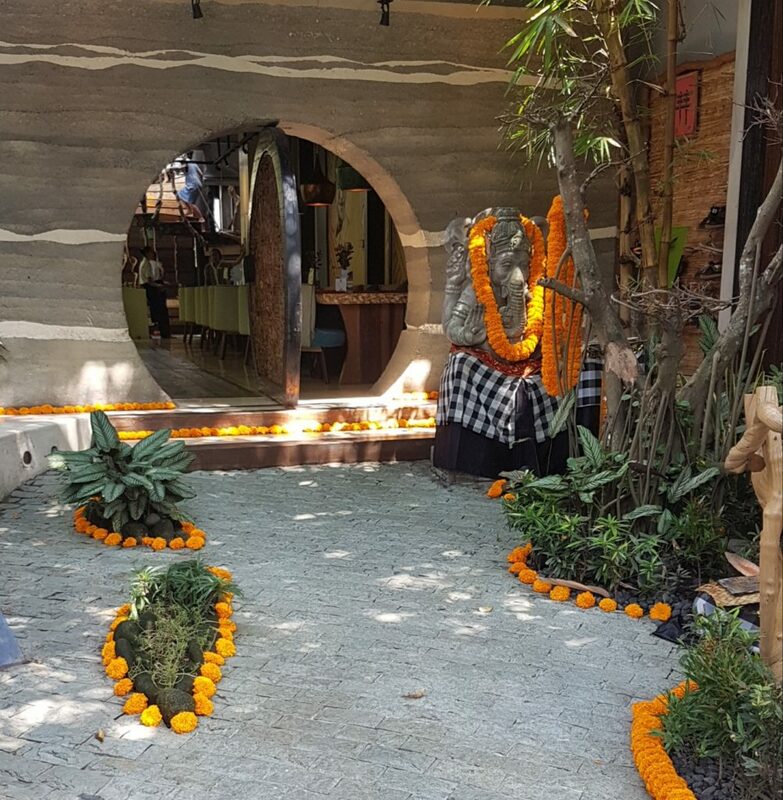 The spirituality, beaches, sun, connections, entrepreneurship & digital nomads, affordability, the smiles, the yogis, and the FOOD. I can't say enough good things about the healthy food options here. An1ere are so many restaurants with the incredible atmosphere. I would live in any of these back home. For example, Clear Cafe has become one of my favorite places in the world. They've got delicious healthy food options, but they could serve you plain warm water and the ambiance would be would hanging out there. They do not serve Pesto Steak and Eggs like this, though. Which is a shame, I think. What do you eat for breakfast when you're traveling? Do you gravitate towards Western-style breakfasts? Do you eat like a local? Do you demand Pesto Steak and eggs? Packed with protein and flavor, this dish is ready in minutes! 1–2 Tbsp olive oil, ghee, coconut oil, etc. Heat frying pan over med-high. Add enough oil to coat pan. Add the lighter colored, stem-end of the bok choy. Stir in pesto and saute for about a minute. Stir in bok choy tops then push to one side of the pan. 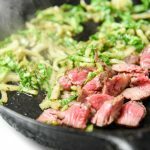 Add in steak slices and heat for 1 1/2 – 2 minutes, stirring in with pesto bok choy. Transfer to a plate, add more oil to the pan and fry eggs over-easy or as desired. Salt and pepper to taste. 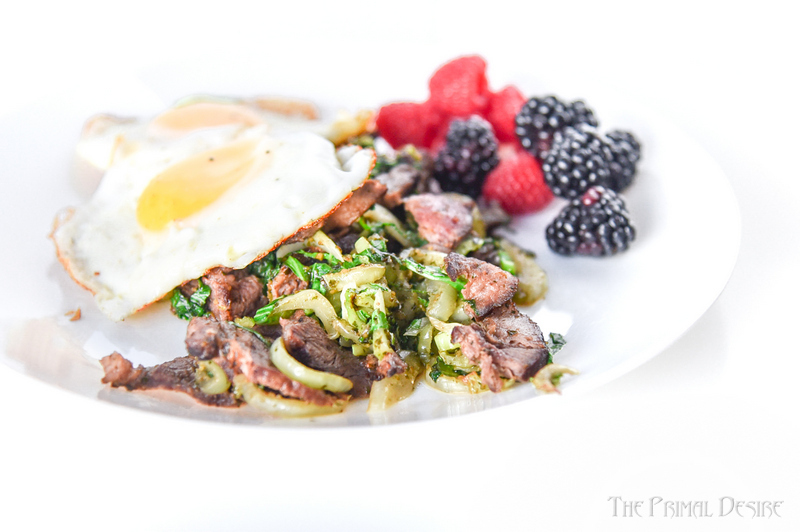 Top steak and bok choy with eggs. Serve with berries or cherry tomatoes. I love pesto on everything! Sounds tasty! Right?! It’s such an easy way to bump up the flavor power of anything. Most sauces I suppose. Have you checked out our Creamy Fenugreek Sauce yet? A definite breakfast of champions! Adding Pesto is such a great idea! I love this keto breakfast, and cooked with lots of butter! The pesto brightens things up for spring so much! I use ghee for most of my cooking, but yeah baby, yeah! This is my kinda breakfast! Just made it this morning and it hit the spot! Thanks! Right on Renee! Thanks for commenting! 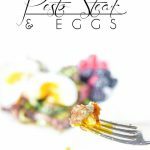 I love pesto on everything, especially eggs! Definitely my kinda breakfast. Right on Jean! Glad we are speaking your language! Gorgeous! I’d eat this breakfast, lunch or dinner! Thank YOU for commenting Irena! Omg. i love pesto. i love steak. i love eggs. this breakfast is calling my name. and when traveling, i try to find the right balance between getting what i need to feel good and adapting to the culture. sometimes it’s tricky but it’s worth the effort. 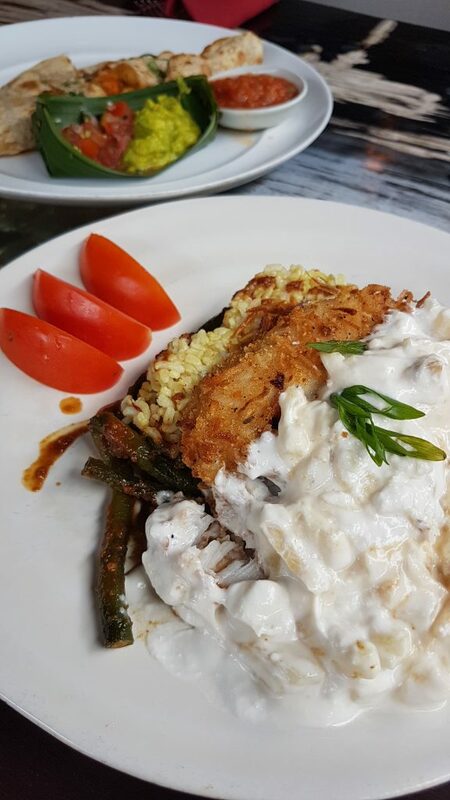 It’s totally calling your name! Bok choy doesn’t get enough love. I’m so glad you included it here. Great touch! You are soooo right about that! So neat that you’re loving Bali, I’d love to go someday! I always gravitate towards whatever is local, but at home I lean towards Western style breakfasts too! Bali was an incredible experience with great food! I love this recipe. So easy to make and delicious! I can have this every day! Plus it’s quick to make! THis a great idea for a hearty and filling breakfast, it will keep me going all day! You got it Anne! Thanks for checking it out! Yes! I would happily eat this for breakfast!! As an herbalist, I am always ‘up for’ adding pesto and greens to any meal! When traveling, I usually eat fresh food and often what locals eat, when possible. I am with you.. Not fond of all the high grain/bready breakfast.. Love eggs + bok choy or even left-overs! Right on. What travels do you have coming up in the future?